Radishes are root vegetables, much like beets and turnips. They grow small red, pink or white edible roots, generally 1 inch in diameter and up to 3 inches long in some varieties. Radishes are grown in areas around the world, and are among mankind's oldest cultivated plants. Though adaptable, radishes are most productive under specific conditions, and pH is an important consideration. The pH of soil refers to its acidity or alkalinity, and is an important factor for all garden crops. A pH between 6.6 and 7.3 is generally considered to be neutral. A lower pH indicates acidic soil, while a higher pH means that your soil is alkaline. Seldom does soil have a pH higher than 9.0 or lower than 3.5, and most garden vegetables prefer soil that is neutral to moderately acidic, with a pH somewhere between 5.5 and 7.0. Opinion is a bit divided among experts when it comes to the ideal pH for radishes. They will grow well if your pH is between around 6.5, but some sources suggest a slightly higher or slightly lower pH. Ohio State University Extension suggests that radishes grow best with a pH between 5.2 and 5.6 in muck soils, but a pH of 6.0 to 6.8 is preferable in mineral soils. If the pH of your soil is too low, applying agricultural lime is the usual method to raise it. Crushed limestone and dolomite are two common liming materials. Composed of calcium carbonate, they raise pH by neutralizing acid. If your soil's pH is too high, you can lower it by mixing in sulfur, although this is a temporary measure that may need to be repeated annually or every few years. If you are unsure, a soil test from your local university extension office will tell you the pH of your soil. 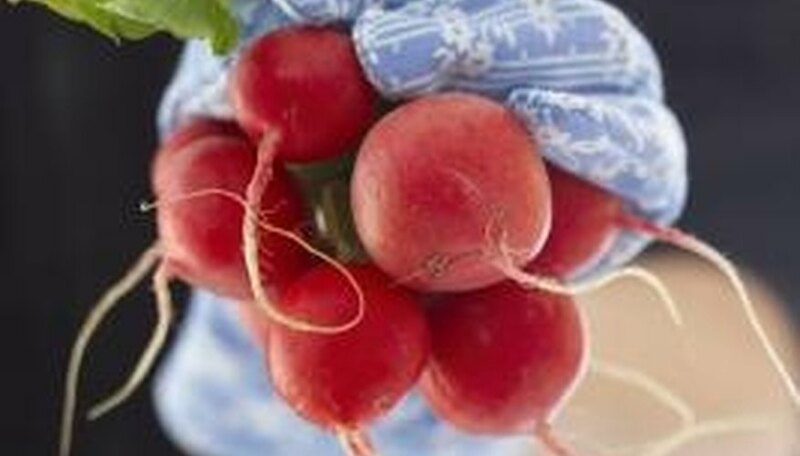 Radishes are cool-season vegetables that do not fare well in hot, dry conditions. If you live in a southern region with a warm climate, you should plant your radishes in early spring for a late-spring harvest, or in late summer for a fall harvest. They grow best in fertile, moist, well-drained soil with ample water and sunlight. Texas A&M University; Radish; Joe Masabni, et al.